Use this form to register your plans with us about the Fast. Want to learn more about water fasting? Check out these practical tips. We are undertaking the Fast in September to show our support for the call of Pope Francis for urgent action to move away from coal, oil, and gas and to a renewables- and energy-efficiency-based economy which respects and protects our natural environment and the people. The Pope will be coming to Washington DC on September 24-25 and to New York and Philadelphia after that. He will be speaking before Congress on September 24th and the United Nations on September 25th. Part 1 of our plan is to occupy the sidewalk in front of the FERC building during the daytime hours with signs, banners and leaflets for FERC employees and others walking by. During our time together, we will coordinate daily support, medical oversight, transportation, and simple accommodations for our fasters. We will also be supporting actions in DC during this time such as the Moral March for Climate Justice, Grandparents Climate Action Day, and others. Part 2 of our plan is to join with those who cannot make it to DC, but who can support the Fast from their own communities. We welcome solidarity fasts in front line communities fighting gas infrastructure expansion, at offices of relevant public officials or members of Congress, at the offices of energy companies, or at fracking, pipeline, compressor station, storage terminal or LNG export sites. We encourage families, schools, faith communities, and civic organizations to organize “rolling fasts” among their members during the time period of September 8-25 whereby each person may only fast for a day or two, but together their group’s voices are added to this call for radical change at FERC. On the 25th, the last day of the Fast, BXE will be organizing a larger action possibly including nonviolent civil disobedience at FERC. Details of this action and its supporting partners will be released as they evolve. Check back soon for more. 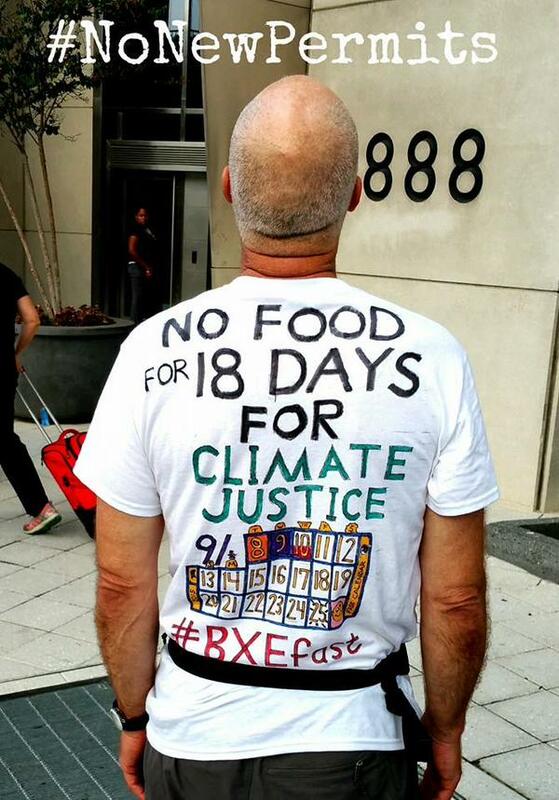 Send your pictures, stories, and testimonies before and during the Fast to actions@beyondextremeenergy.org so that we can publish them on our website and in front of FERC. We welcome the participation of all who want to join us. Whether you can come to DC or whether you will support this fast in your own community, use this form to register your plans with us about the Fast. Other questions? Just ask! Email us at actions@beyondextremeenergy.org. Pingback: Call to Action: "No New Permits Fast"